Children under 18 may be added as complimentary guests of the registered attendee. Those in your party who are aged 18 and up and are not current paid FALA members should be registered separately as non-members. Admission is $25 for non-members, age 18 and up. Children under 18 may be added as guests of the registered attendee for free. Those in your party who are aged 18 and up and are not current paid FALA members should be registered separately as non-members. Paid FALA members receive complimentary admission. 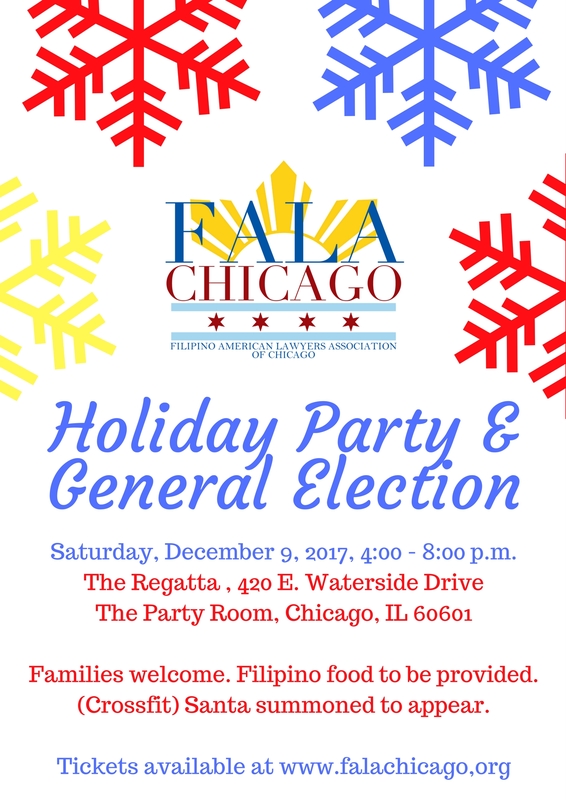 If you are an attorney or law student who would like to start or renew your FALA membership, please visit our membership signup page (click "Join Us" on the homepage of this website) before registering for this event. Families welcome! Filipino food provided. (Crossfit) Santa summoned to appear. Admission is FREE for paid FALA members and children under 18, $25 for non-members age 18 and up. If you are an attorney or law student who would like to start or renew your FALA membership, please visit our membership signup page before registering for this event.